Former Ghanaian U-23 international, Joetex Frimpong, on Sunday at the National Stadium, Abuja, helped his Nigerian team, Enyimba International FC of Aba, to retain the MTN CAF Champions League, which his team won last year. The Ghanaian who was in the Enyimba party that lost the first leg 1-2 in Sousse was introduced by manager, Okey Emordi in the 60th minute to replace another forward, Emeka Nwanna. Although Joetex put his best, he was unable to register a goal and the encounter ended 2-1 in favour of the Nigerians with aggregate scores at 3-3. Joetex finally put his name on the scoresheet when he beat Etoile's Nigerian goalkeeper, Austin Ejide, to score Enyimba'S second penalty kick. The Nigerians finally won 5-4 on penalties after substitute goalkeeper and penalty specialist, Dele Aiyenugba saved one of the penalties and Enyimba retained their title 8-7 on aggregate. Joetex, who was the clubs highest goalscorer when the club won the title last year had earlier told www.ghanaweb.com that he wants to be part of the victory party and use the competition to stage a return to the Ghanaian national team, the Black Stars where he had a stint under former manager, Burkhard Ziese. With today's victory, Joextex Frimpong has become the first Ghanaian to win the CAF Champions League twice. 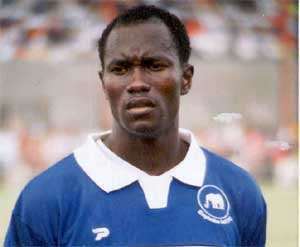 He also put his club's name in CAF's history books as the first to retain the CAF Champions League.